We look at if it is good for them, whether it should be avoided or welcomed and what the benefits and disadvantages of the guinea pig eating it or not. We’ve looked at the obviously good, we’ve looked at the obviously bad, we’ve looked at the ridiculously good, we’ve looked at the ridiculously bad!! But they are in answer to what we feel people are looking for, and we believe no question is too stupid. Its all for the good of our Guinea Pigs. If you can’t find a food you’re looking for, use the search bar at the top right of the screen by clicking the magnifying glass and typing in the food you’re looking for. If its still not there, then please do let us know, and we’d love to review it. Wow, thanks for answering so many of my questions! 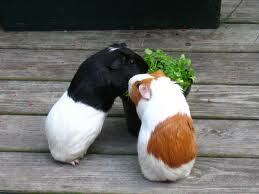 One thing I am still wondering about, can I feed my guinea pig the mint that is growing in my yard? In general, is it safe to offer my guinea pig assorted leaves & vegetables, and assume it will avoid anything it shouldn’t eat? Thanks. Thanks for this great reference. I have a Meyer lemon tree and wonder if g. pigs can eat the leaves and/or the branches…I know they can eat orchard branches but is citrus included in that (since it is technically grown in a grove). Can they eat Kale please ?